The LX Series is the only gas-fired humidifier that combines the highest efficiency on the market with ultra-low NOx in a single design. Condensing design for highest efficiency and PVC venting. Ultra-low NOx certified to SCAQMD 1146.2 standards. Smart drain technology adjusts drain intervals automatically based on water quality. Universal water control for use with any water type, including RO/DI water. Modulating output with minimum 5:1 turndown for accurate humidity control. Outdoor and indoor models for application flexibility. 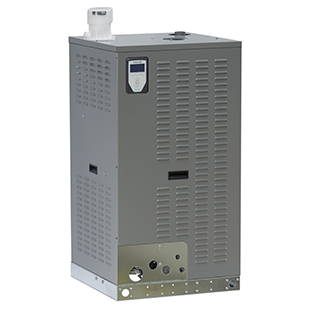 The GTS humidifier LX Series is now available to order in a full range of capacities, from 50 to 600 lbs/hr. All sizes of our LX Series humidifiers are available to order, with Models LX-50 to LX-150 shipping now and Models LX-200 to LX-600 beginning to ship in September 2019. Also in September, all LX Series humidifiers will ship with our new touchscreen display. This new display has all the industry-leading functionality of our Vapor-logic® controller with an intuitive interface, animated graphics, and a Set-up Wizard for easier start-ups.